For Howard Halpern, dressing bold is a personal philosophy that extends to his men’s haberdashery, H. Halpern Esq. He plucks a memory from the 1960s to explain. Tucked inside the Intercontinental Hotel on Front Street, H. Halpern Esq. boasts a vibrant selection of menswear. Against the white walls, you see splashes of salmon, lavender and mint in the shirts, ties and socks. The store is 30 years old but last year’s renovations make everything pop. For Howard and his daughter Meredith, who manages the store, that pop is what’s important. Not that long ago the vibrant colours found in their store were too peculiar for many Canadian men. That’s where their proximity to the Toronto Convention Centre helped. While Howard waited for Canadian men to catch up, he had a reliable base of foreigners and tourists whose tastes were less boring. Now that young men have embraced colour, Howard and Meredith no longer have to dull the stores playful fashion sense. “There’s no more need to appease people,” Howard says. 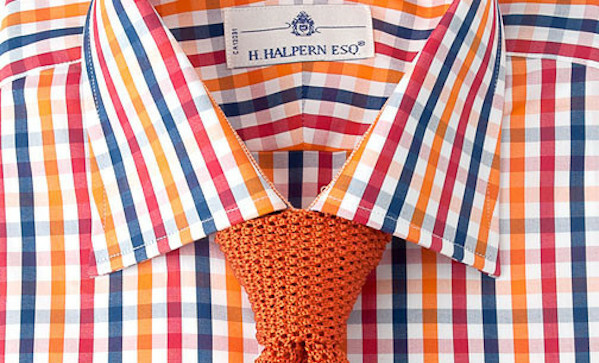 With its own line of dress and casual shirts, H. Halpern Esq. uses suppliers around the world but design and manufacture them in Toronto. They cherry pick items like blue paisley ties and pocket squares and plant them in their shop’s showcase. “We like local sources and it helps to have made in Toronto items,” Meredith says. There’s also a blend of other brands, Howard says, holding up a corduroy shirt festooned with floral patterns from designer Robert Graham. “You know you can come here for colour,” Howard says. You’ll also find wood or glass cufflinks and some great-looking wooden watches from Tense. And for the store’s 30-year anniversary, they’re giving away mother of pearl collar stays. As you can tell, Howard obsesses about the details. On the day I visited the store, he’s wearing a purple paisley bowtie, lapel flower and a pocket square to complement his herringbone blazer. Meredith inherited his taste for brash colours. She’s sporting a technicolour blazer that would make the biblical Joseph blush. I look down at my own clothes. I picked the wrong day to dress down. Howard and Meredith also want you to know that online or in-person customer service is what they stress. “Every order that comes in is looked at by our staff,” Meredith says. “Every parcel that goes out is picked, packed and shipped by us.” And the final touch? A thank-you card. Howard says this isn’t the bland kind of store where your father shopped. It’s not a store for the man in the gray flannel suit. It’s a store for successful men who want to poke out in a sea of sameness. “We do carry a plain white shirt but we keep it in the cabinet,” Meredith says.